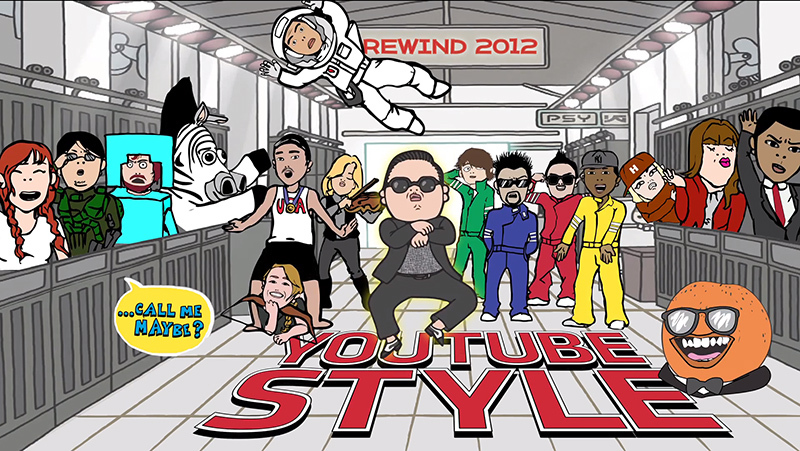 If It's Hip, It's Here (Archives): YouTube Rewind 2012. The Top Watched Videos and A Mash-Up Of The Most Viewed Videos Of The Year. YouTube Rewind 2012. The Top Watched Videos and A Mash-Up Of The Most Viewed Videos Of The Year. This year, Korean Pop music transcended boundaries and took the world by storm. Cover songs, parodies, and "do-it-yourself" music videos from all genres entertained us in countries near and far. And you participated in conversations at a global scale, uploading videos to share ideas on everything from nonprofit campaigns, to political satire, to new and surprising voices and talents. Plus, all over the world, you tuned in for the most up-to-date news footage of presidential elections, natural disasters and more. 2012 was a big year for YouTube. You’ve been watching over 4 billion hours of video a month. Millions of creators are using YouTube channels to experiment with innovative forms of entertainment, explore their passions and interests, take creativity and pop culture to new levels. 2012’s top trending videos and top channels showcase this creative ingenuity in ways we'd never before thought possible. • "Call Me Maybe" by Carly Rae Jepsen - Feat. Justin Bieber, Selena, Ashley Tisdale, etc. • Barack Obama vs Mitt Romney. Epic Rap Battles Of History Season 2. • Facebook Parenting: For the troubled teen. This year, YouTube looked not just at views, but also shares, searches, likes and responses to identify the 10 videos that everybody was talking about in 2012. On YouTube people don’t just view a popular video, they remix, share, and parody, building a fan community that extends far beyond the watch page. They took all of this into account to ensure that they truly captured the “watercooler moments” of the year. Is "Gangnam Style" the most viewed YouTube video of all time? Yes. Currently, "Gangnam Style" is the most viewed video on YouTube and it will likely become the first video to hit one billion views. You can see the top trending video lists for each country that has a list on the 'Browse' tab of the global YouTube Rewind channel. You can also choose from this list of country channels to visit the channels in their native languages. Why isn't a top trending video list available for every country? YouTube tried to make top video lists for as many countries as possible based on available information. YouTube is popular globally. 70% of views come from outside of the United States, so their global list is also representative of what people all around the world were watching in 2012. Just how much YouTube were people watching this year? An astounding four billion hours of video every month on YouTube. For the last few years YouTube has made a video to highlight the top videos of the year. This year talented YouTube creators had billions of views on their channels and they helped entertain the world all year long, so YouTube wanted to celebrate these creators and have a little fun while they were at it. What a collection indeed! It has it all from the those making top news to gathering top views.